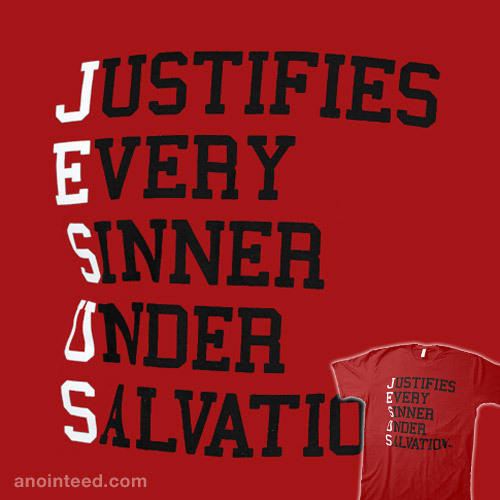 Jesus “Justifies Every Sinner Under Salvation!” In Romans 5:8-10, Paul tells us that “God demonstrates His own love toward us, in that while we were still sinners, Christ died for us. Much more then, having now been justified by His blood…” Christ took all of our sins upon Himself, as if He had committed them, and attributed His righteousness upon us, as if we had lived His life. We are ALL sinners in need of a Savior but, because of His sacrifice, God sees us just as if we had never sinned! Let this design be a reminder of our need for a Savior and to be thankful for His sacrifice! Let it also challenge us to boldly declare what Christ has done for us wherever we go!